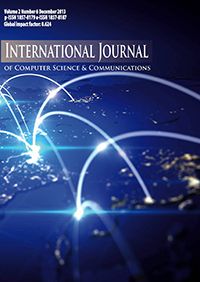 International Journal of Computer Science & Communications is a double-blind peer review online journal published by Association for Anglo-American Studies, Macedonia. It is dedicated to the latest advancements in Computer Science & Communications. It is an openly accessible journal published bimonthly and it is focusing on in different areas of computer science and communications. The goal of International Journal of Computer Science & Communications (IJCSC) is to provide a platform for scientists and academicians all over the world to promote, share, and discuss various new issues and developments in different areas of computer science and communications. The scopes of the journal include, but are not limited to, the following fields: Advances in Computed Tomography; Advances in Internet of Things; Advances in Molecular Imaging; Advances in Remote Sensing; Advances in Communications and Network; Advances in Circuits and Systems; Advances in E-Health Telecommunication Systems and Networks; Advances in Intelligent Control and Automation; Advances in Intelligent Information Management; Advances in Communications, Network and System Sciences; Advances in Internet and Distributed Systems; Advances in Intelligence Science; Advances in Computer and Communications; Advances in Data Analysis and Information Processing; Advances in Intelligent Learning Systems and Applications; Advances in Information Security; Advances in Software Engineering and Applications; Advances in Signal and Information Processing; Advances in Sensor Technology; Advances in Applied Sciences; Advances in Antennas and Propagation; Advances in Optimization; Advances in Social Networking; Advances in Wireless Engineering and Technology; Advances in Wireless Sensor Network, etc.